Passion fruit is an egg-shaped tropical fruit that is also called a purple granadilla, the passion fruit has a brittle, wrinkled purple-brown rind enclosing flesh-covered seeds, something like a pomegranate (granadilla means "little pomegranate" in Spanish). The seeds are edible so you can eat the orange pulp straight from the shell. Passion fruit is more commonly sieved and its highly aromatic pulp and juice are used as a flavoring for beverages and sauces. The pulp has an intense aromatic flavor, while the texture is jelly-like and watery. The flavor is likened to guava. Passion fruit is a good source of vitamins A and C, as well as potassium and iron. One passion fruit has only 16 calories. When eaten with the seeds, a serving is an excellent source of fiber. 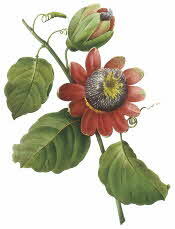 Passion Fruit is generally eaten fresh but may be cooked for use in sauces and fillings. Begin by cutting the fruit in half and scooping out the fleshy pulp with a spoon. Spoon the pulp over ice cream or other soft fruits. The pulp makes a delicious jam or jelly and the seeds add a unique crunchy texture. To remove seeds: Strain in a non-aluminum sieve, or use cheesecloth, squeezing to extract the juice. Top chicken, fish, or pork with a spoonful of passion fruit for a change. Add passion fruit to mixed green salads or fruit salads for a new taste. Spoon this fruit over low-fat yogurt to make a colorful treat.